My name is Thomas Hug and I was born in Switzerland some time ago :). This page is used to provide you some information about my Hobbies, the things I do when I don't feel like to Work. In 1997 I registered myself to the FVS, which provides young pilots the chance to fly without to spend a lot of money. I completed all three FVS courses and am now in the possession of a JAR private pilot license. The first FVS course was not like my colleagues with normal planes, but with gliders. In the first moment I wasn't very happy they put me in a glidercourse. After the first flight, i immediately changed my opinion :) I was so happy that I started to finish my glider pilot license just after the course and graduated in 1999. Because the first thing everyone (or not?) does with flight simulators, is to do all possible aerobatics with this planes :) Why not in real world? Since summer 2001 I am allowed to do aerobatics with gliders! Of course I had to do a skill test for this nice ACR extension in my license. 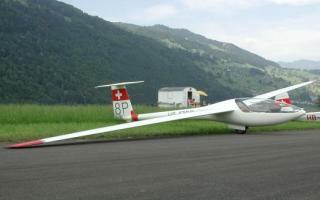 Check out the SG Pilatus homepage for more information on gliding. There are also some nice pictures! Copyright © 1999-2004 Thomas Hug. All rights reserved.